A new breed of diamond tester, reliable diamond tester for many professions including antique jewellery dealers and diamond sellers & buyers. Compact and slim line for easy carrying and use and very easy to operate. Requires 1 x 9v battery (Included). (Please note that this Diamond tester can not distinguish synthetic Moissanite Please view relevant tester below). * 9v Battery. Click here for spare batteries..
Moissanite tester, for many professions including antique jewellery dealers and diamond sellers & buyers. This tester is to test for the new threat to the jewellery trade, the moissanite stone. Compact and slim line for easy carrying and use and very easy to operate. Comes in leather pouch and requires 1 x 9v battery (Included). 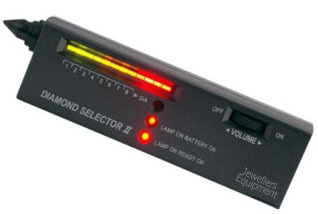 This tester is used after a positive testing with a diamond tester. 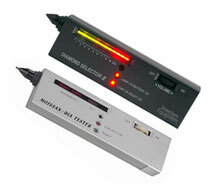 Diamond tester and Moissanite tester set. One of each type of tester. A must for professionals. 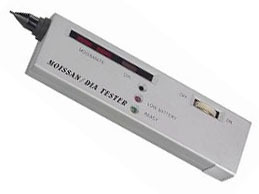 The Moissanite tester is used after a positive testing with the Diamond tester. For electronic gold and silver testers please click here. In today�s market everything with an expensive price tag such as Rolex watches, Versace clothing and even diamonds, will all have imitations. The main problem caused by imitations is the worry of being fooled in to paying a high price for a fake. With diamonds there is a solution which is a diamond tester. Diamond is a pure carbon, formed around 30 or 40 millions years ago. It is the hardest natural material known to man. When buying diamond there are four main qualities to look for, colour, clarity, cut, and carat weight (These basic qualities are commonly known as the four C's). Moissanite is the newest and best diamond simulation on the market which not even diamond testers can tell it is an imitation. Now that it has been introduced into the world market it has created a new danger to everyone involved in the diamond jewellery business. Moissanite may be a fake stone but they are still not a cheap stone. Moissanite stones are so much like diamonds that they can easily be sold as natural diamonds. The Moissanite stone fails when it comes to natural materials as it lacks a natural element that only diamonds contain. There are now new testers which are specifically designed to test for Moissanite stones. Never try and tell if a diamond is real or not using just the naked eye. Here are the common main ways to examine a diamond accurately. Microscope / Loupe / Eyeglass: Examine using a standard 10x magnifying glass called a jewellers loop. This enables someone to see the 4 C's in stones a lot more clearly. Diamond / Moissanite Testers: A diamond tester uses light to verify that the stone you are examining is really a diamond. A Moissanite tester works on different principles to diamond testers but is a must in today�s diamond market. Originally developed to rapidly distinguish genuine Emeralds from pastes and doublets, it is also a valuable aid in identifying a host of other colored stones. Also called a Jadeite Filter, the diameter of the filter is 18mm, length when closed is 53mm, length when open is 91mm. This high quality hard-wearing filter is constructed from white-enameled alloy metal. Originally developed to rapidly distinguish natural Ruby from synthetic ruby. It is invaluable in distinguishing between red stones such as Ruby, Spinel, Tourmaline, and Garnets. Filter diameter is 18mm, length when closed is 53mm, length when open is 91mm. This high quality hard-wearing filter is constructed from white-enameled alloy metal. Chelsea Filter and Ruby Filter set. One of each type of filter. Invaluable for professionals. Hand held UV lamp with built in LED torch. Powered by 4 x AA alkaline cells (included). Click here for spare batteries. Very useful source of Long wave U.V. light (UV-A) at 365nm. Many minerals (for example 30% of diamonds) exhibit photoluminescence at this frequency. This UV lamp is also useful for checking counterfeited bank notes in jeweller's shops. Dimensions are 162mm (L), 56mm (W), 22mm (H). Slide the side switch towards "tube" to switch on the UV lamp. Slide the side switch towards "torch" to switch on the white lamp/torch. Slide switch to the centre position to switch off. Quality hand held darkfield Loupe has 10x magnification and an 18mm diameter lens. Allows you to view gems against a black background with strong lateral lighting exposing inclusions clearly as an aid to grading and identification. Loupe is 100mm long and 29 mm in diameter and has a thumb screw for firmly fixing to the light source. The included light source is a shock resistant flashlight with an anodized aluminium body that is 153mm long and 24mm at its largest diameter. Powered by 2 x AA alkaline cells (included) and with a high intensity halogen bulb. Click here for spare batteries. Everything fits into a leatherette wallet for perfect portability. Acid testing kit for silver and gold, Comes complete with three bottles of testing solution (silver, Gold low ct & Gold high ct), with droppers attached to the inside of the caps, also includes instructions. Different reactions are produced for different metals letting you know instantly if an item is gold or silver. Genuine silver is indicated with a deep red colour.